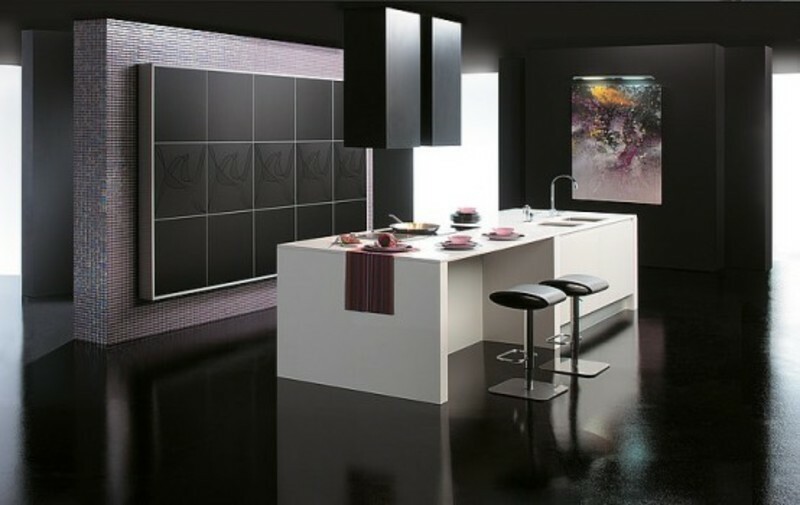 Contemporary Black Kitchen Design Idea by Gabanes – This kitchen is the dream for modern style lovers; contemporary, luxurious and functional. Using the minimalist style, Gabanes designed a very stylish glass wall in black matte with beautiful drawings in glossy black and grey, the wall is decorated by a mosaic frame which creates a luxurious and unique look to the kitchen. The main piece in this kitchen is the island; it’s a very useful kitchen island equipped by a cooker, a stainless steel sink and the most interesting is the sliding door which is integrated in its internal side. viaMore Design Ideas: a mosaic frame · a Spanish kitchens producer · a stainless steel sink · dinning table · kitchen island · stainless steel sink · storage equipped · stylish glass.